Ian Oliver has always wanted to know how things work. The nitty-gritty of machinery, how it's engineered, and what happens mechanically when you pull a lever or flip a switch. 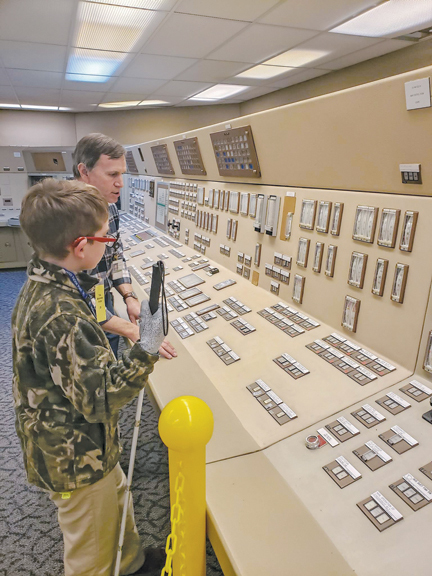 So he was fascinated by the Bellefonte Nuclear Plant that his family would pass on trips toward the Great Smoky Mountains, asking how it generates power, how long it took to build and other rapid-fire questions steeped in his passion for science. Ian got all his answers and then some in February on the most VIP tour imaginable, a visit initiated by IBEW members. 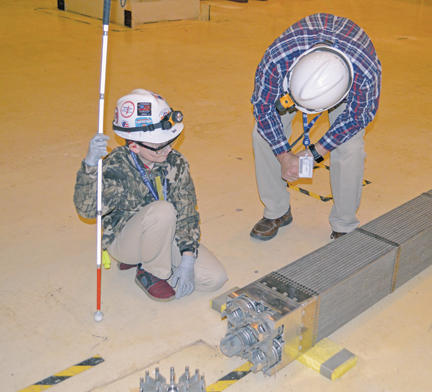 They were determined that the inquisitive 11-year-old from Huntsville, Ala., would see the inner workings of a nuclear plant while he still can. Ian is going blind. Even scarier, the limited, blurry sight he still has could vanish without warning. 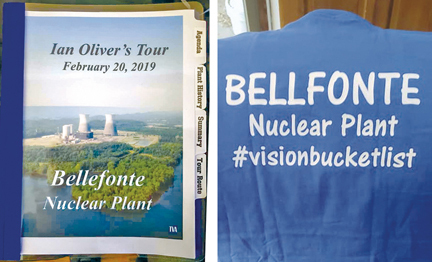 At Bellefonte, a plant safe to visit because it's never been activated, he saw, touched and experienced things that few people outside the nuclear industry ever have. "It was sooooo cool," Ian said afterwards, stretching his o's for maximum effect. "I wanted to see a lot so that I can remember, so if I'm blind I can know what it looks like." It was an unforgettable day as well for the union tradesmen and managers who rolled out the red carpet. "Everyone really felt like it was a blessing, that it was one of the best days at work they'd ever had," said Jim Springfield, a Tenth District international representative. "Virtually every person there participated in one form or another, and they were tickled to death to do it," he said. "He's a great kid — very curious, very respectful, a very nice young man." Jennifer Oliver feared early on that something was different about her infant. He would stare at lights but not other objects. Noise didn't waken him, not even the roar of her vacuum cleaner a few feet away. Ian got his first pair of glasses when he was 6 months old and hearing aids a year later. Doctors diagnosed Stickler Syndrome, a rare connective tissue disorder gravely affecting his eyes and ears, and weakening his bones and joints. He's undergone 40 surgeries since he was a year old, 32 of them on his fragile eyes. What's left of his failing vision could be gone in an instant, like the day in first grade when he stood up in class and his right eye went black. It had been his "good eye." His battles have gotten steeper in the years since: more complicated surgeries, chronic retinal damage, diagnoses of glaucoma and cataracts, treatments that left him vomiting on the 2½-hour drives home from his Birmingham hospital visits. There's also weekly speech therapy and physical therapy and no end of other appointments related to Ian's multiple medical conditions. None of it has stopped Ian from being a typical, active, goofy fifth-grader who loves video games and silly jokes. He's also a nearly straight-A student with a passion for anything STEM — science, technology, engineering and math. "Ian's been into science and math since he was little," Oliver said. "His favorite toys are Legos, toys that you can put together. He didn't watch cartoons. He likes shows about how things are made, how they're built." She and his dad — a master plumber — always stress that one way or another "he can be whatever he truly wants to be." "He knows that being a pilot or being in the Army isn't attainable, but there is no reason why he can't do something to support those careers," Oliver said. "This past summer, he met a NASA scientist who is completely blind." She's raising Ian no differently than his four siblings; same rules, expectations and chores. For him that includes scooping the cat box, cleaning his room and folding his laundry. But with no time to waste, she also wants him to experience as much as he can. Last year, she encouraged him to start a "vision bucket list." Among other activities, he's spent time with Huntsville police officers and airport firefighters, operated a flight simulator and, thanks to a Facebook friend's time-share donation, he and his family are hoping to attend the National Federation of the Blind conference in Las Vegas in July. Oliver, a paralegal, wrote about the bucket list on "Ian's Vision," a Facebook page she launched in 2015 to reach families like hers. A fierce advocate for her son and other vision-impaired children, she also uses the page to raise awareness about such things as the urgent need for more and better Braille curriculum. "Ian will say, 'Don't feel sorry for me. This is God's plan,'" Oliver said. "He'll say, 'Everything I'm going through, everything my mom's going through, it's not just about us. It's about the kids who come after us and the parents who don't know how to help their kids." It was their Facebook page and one of its followers — the wife of an IBEW member — that brought Ian to Bellefonte. When Glenn Camp, president and assistant business manager at Pittsburgh Local 29, needed eye surgery last fall, his wife began searching for information about people with retina problems. Paula Camp discovered "Ian's Vision" and was soon in tears reading about Ian's struggles and his mom's devotion. She felt powerless to help until she scrolled through his bucket list and spotted his wish to see a nuclear plant. She called her husband, whose local represents nuclear workers. "I'll see what I can do," Glenn Camp told her. He called a retired international representative, leading to the Tenth District office and ultimately to Jim Springfield, who called Bellefonte's site manager, Jim Chardos. Camp had no idea how much his phone call had accomplished until the day of the tour, Feb. 20, when his wife began texting pictures that Oliver — with Chardos' permission — was posting online. "I was pretty happy to see them," Camp said. "We were actually in early negotiations and to be frank it wasn't going real good. So seeing those pictures was kind of my high point." Grateful and overwhelmed, Oliver also shared pictures from the mountain of bling that Chardos and his crew sent home with Ian, including a hard hat with IBEW and other trade union stickers, a "Vision Bucket List" T-shirt, a plant badge with his photo, framed certificates, a personalized booklet chock full of plant history and even materials for Ian's classmates. "It was the most amazing day," she said. "They were there to make the day great for Ian and it seemed like Ian made their day great, too. It made me smile, to know that Ian touched them." Bellefonte employs 37 people, most of them trade unionists maintaining the offline plant while the Tennessee Valley Authority works to sell it. One of the many things Ian had wondered about was "how that big of structure needs that little people." "It looks like there should be something inside them, but there's nothing," he said later. "Nothing!" With an emphasis on safety, "super-nice" workers let him push buttons to start equipment and trained him to operate a scissor lift. Harnessed in, with a journeyman at his side, up, up he went inside a hangar-sized warehouse. "I looked down and, oh my, how did I survive," he said, laughing. "I was having fun, but 1 percent was like 'Uhhhhhh.'" Just going from building to building "through a little hatch, like on a ship," was a thrill. He even waxed poetic about the narrow hallways he navigated with his white cane. "I call it the 'music tunnel,'" Ian said, a song in his voice. "I have a cane, so I have to swerve it around, so it made a racket every time I did that." He touched a fuel assembly and other components that he couldn't have gotten near if the plant were radiated. Being able to feel things "helps my memory," he said. In his mind's eye, he'll never forget. "It was three hours long," he said. "I will remember every second of it." 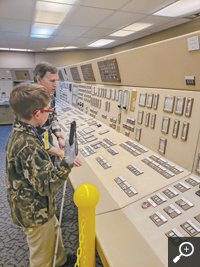 IBEW and other trade union members at the Bellefonte Nuclear Plant in Alabama were "tickled to death" to serve as tour guides in February for 11-year-old Ian Oliver and his mom, Jennifer Oliver. Control room operator David Wayne, a retired Local 721 member on contract at Bellefonte, shows Ian how the plant's control panel works. 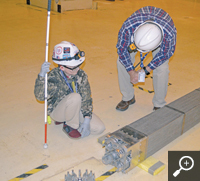 Bellefonte site manager Jim Chardos shows Ian a model of a fuel assembly containing empty fuel rods. Bellefonte staff presented Ian with a bounty of gifts, including a personalized tour book and T-shirt.